Families and alumni far and wide look forward to coming to Tuskegee University’s outstanding Homecoming celebration. Robbie and Saniyah, siblings, are no exception. The highlight of their year is going to watch and join in on the festivities surrounding this amazing college’s Homecoming football game. 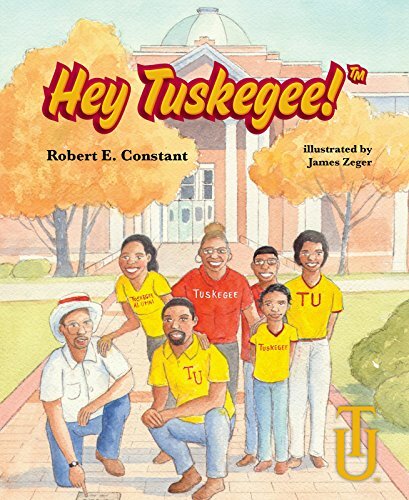 Join Robbie, Saniyah, and the rest of their family as they explore the triumphs of African American history and the beauty of Tuskegee University. Grow in your knowledge and understanding of civil rights as you tour this wonderful college through the eyes of two children dreaming of what life was like a long time ago and of what life could be like in the years to come. Hey Tuskegee was an interesting mix of a history book and a narrative all centered around one amazing university. I found the story very enlightening, as I learned a lot about African American culture and the fight for civil rights. I enjoyed learning about the triumphs of so many brave people, even when the world seemed against them. I loved the learning aspect of the book immensely, but the transition between the facts and the story did seem a bit forced at times. The facts about Tuskegee University’s history were usually told as if Robbie, the young boy, was thinking about them. However, occasionally, the transition between the facts and the rest of the story was a bit rough and unnatural. I did enjoy the little "Hey Tuskegee!" at the end of each page, as it helped to tie the book together and give it a unique flare. The author did a great job by using a unique writing style to create an equally unique story. I found this book entertaining and worth a read. There is nothing offensive in this book.